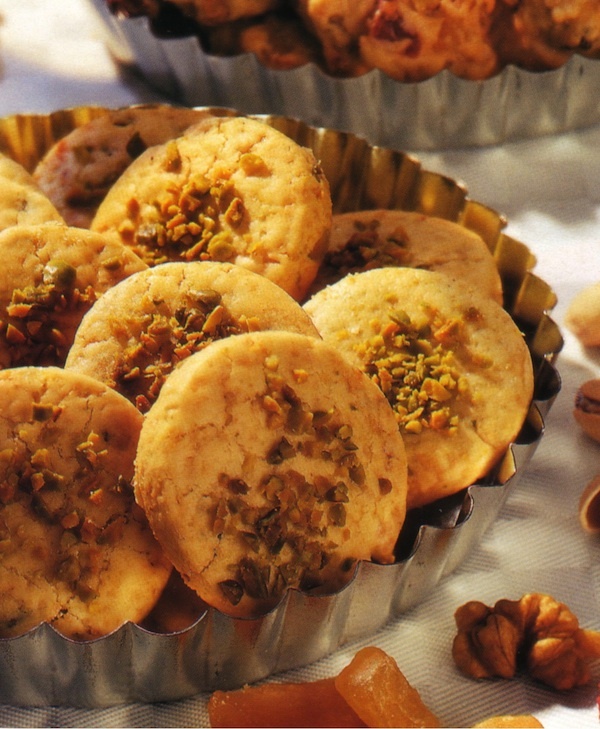 Our German pistachio cookies are of course excellent holiday cookies but you can bake them also throughout the year. They are so delicious that these cookies will become your favorite. It's a great cookie that goes along well with a cup of tea or coffee. If you cannot get pistachios we recommend to use alternatively chopped walnuts. Happy Baking! - Cut butter in small pieces. - Combine sugar, vanilla sugar, salt and butter and beat until creamy; add egg. - Mix flour with starch and pistachios. Add to the dough, knead with hands until you get a smooth dough. - Form a ball and wrap dough in foil; place in fridge for 30 min. - Roll dough on a floured baking board 1/2 cm thick and cut out round cookies. - Brush them with water or some beaten egg yolk, and sprinkle pistachios on top. - Bake for 15-20 min on 160 C or 320 F.